Using TS-DIO24 expansion - how to set a pin? The DIO24 manual mentions BASE+5 for say, the PortA register and I have jumpers off so address selection I/O address is "Base+0x100". Is Base the PC/104 base for 7250? I've noticed for EVGPIO documentation, say I/O 9 is PC104_A1... does that have anything to do with TS-DIO24's A1? I'd love to use evgpio.c or tshwctl.c. I've tried compiling these with the first few lines changed to use a new address. Like changing the syscon address from 0x80004000 to 0x80004100, but that seems wrong (and doesn't work!). So any pointers? I'd imagine this is a one-line code change, or there's already a .c program out there to toggle a pin? The default PC104 base address for an 8-bit peripheral (such as the DIO24) is 0x81008000. 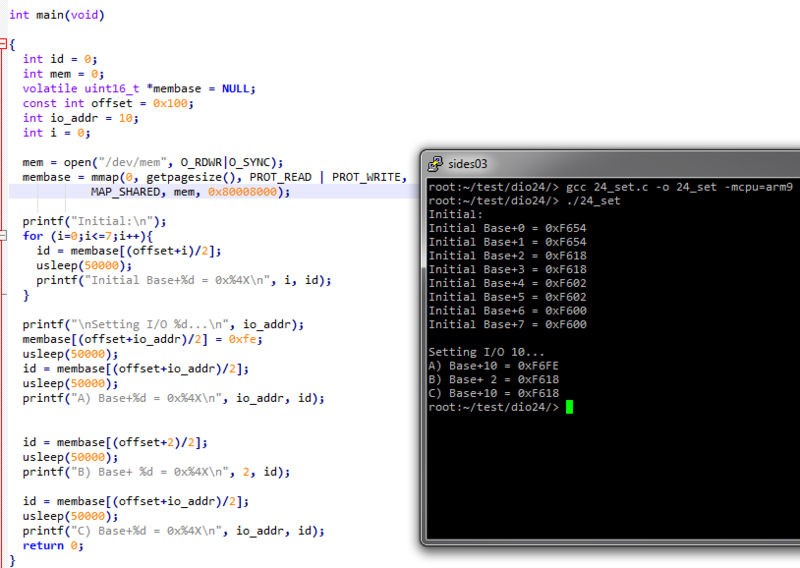 This code will set up a memory map to the 16-bit PC104 space, read and output the Board ID at offset 0x100, and exit. I appreciate the code! I'm making progress but got stuck for most of the day on this now: I think I'm missing something that I'm sure you can clear up - it may be related to that comment you made about the bus cycles. It looks like I'm only reading even registers, and I can't seem to set any permanently (note output line A is different than line C, but it's the same code). Is there a specific wait I need to do? Image is output with JP4 set to on, so we expect 0x18 in Base+2 and 0x02 in Base+4. Well that picture got shrunk down a lot! Ah, I think I got it. I changed the code to use uint8_t instead of uint16_t and stopped dividing by 2.